Product code: ES7938 Categories: Sold Items, Sold Rings. There is such a difference between so many modern rings trying to look antique, and one that has been expertly hand made using the same techniques as to what was used 100 years ago, to create something incredibly exact and beautiful such as in this hand made reproduction platinum diamond engagement ring. Made by one of our Master jewellers, this ring was made by to such a high standard. Not only does this ring retain original antique cut diamonds, but the quality of craftsmanship in this ring is evident from every angle that you admire it from. The detail in this ring is just incredible and shows the difference between a mass produced cast made ring or one such as this which has been hand made to the highest standards. Sitting in the centre is a lovely genuine antique old mine cut diamond that measures 0.59 carats and is G in colour and Si in clarity. Not only does this ring have all the charm and character if a ring made in a bygone era, but it also retains its original diamond that was cut by hand all those years ago. Set with three single cut diamonds on each side that total 0.08 carats, not only do they add more sparkle to the ring, but the detail around the setting is nothing short of magnificent. From every angle that you look at this ring, you will so easily fall in love with it, and if you have been wanting a modern diamond engagement ring with all the charm of yesteryear, then this might just be the special one for you. This diamond engagement ring was hand made by our jewellers using techniques used over 100 years ago. 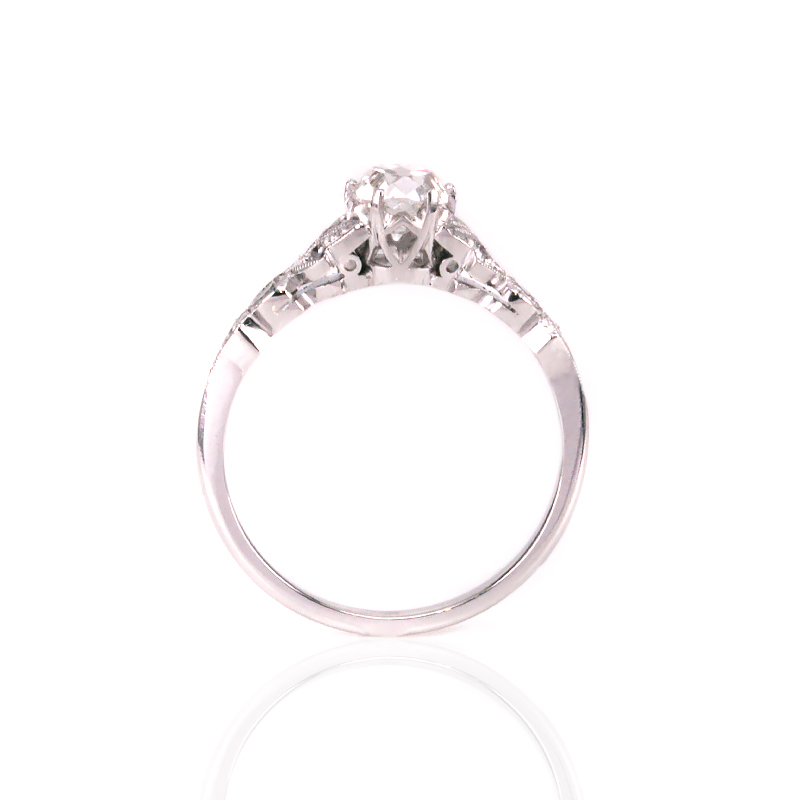 We are able to hand make that special engagement ring for you in a style and design reminiscent of a bygone era.